In 2015, the U.S. Women’s National Soccer Team won its first FIFA championship in sixteen years, culminating in an epic final game that electrified soccer fans around the world. It featured a gutsy, brilliant performance by team captain and midfielder Carli Lloyd, who made history that day, scoring a hat trick during the first sixteen minutes. CARLI LLOYD is captain of the U.S. Women's National Soccer Team and has been named the FIFA World Player of the Year for two years in a row (2015 and 2016). The midfielder led the U.S. team to World Cup victory in 2015 and also scored the gold-medal winning goals in both the 2008 and 2012 Olympics. She has played in three FIFA Women's World Cup tournaments, helping the U.S. win bronze, silver and then gold. In 2015 she was also awarded the FIFA Golden Ball and the Silver Boot. The New Jersey native currently plays for Manchester City Women FC in England. 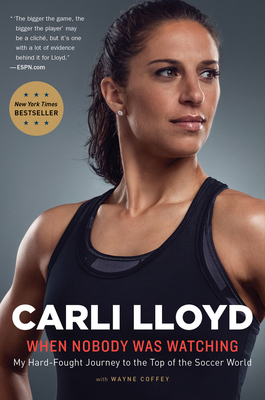 Follow Carli at carlilloyd.com or on Twitter @CarliLloyd.